Gravel is more porous that asphalt, concrete, or brick and spread over a gentle grade will moderate storm runoff- which keeps debris off sidewalks, public streets, and out of storm drains. Gravel driveways also reduces surface ponding which limits the destructive impacts of the freeze-thaw cycle that so often shortens the lifespan of an asphalt driveway. Gravel drives are more affordable for longer rural county driveways and large industrial parking lots comparative to asphalt or concrete. 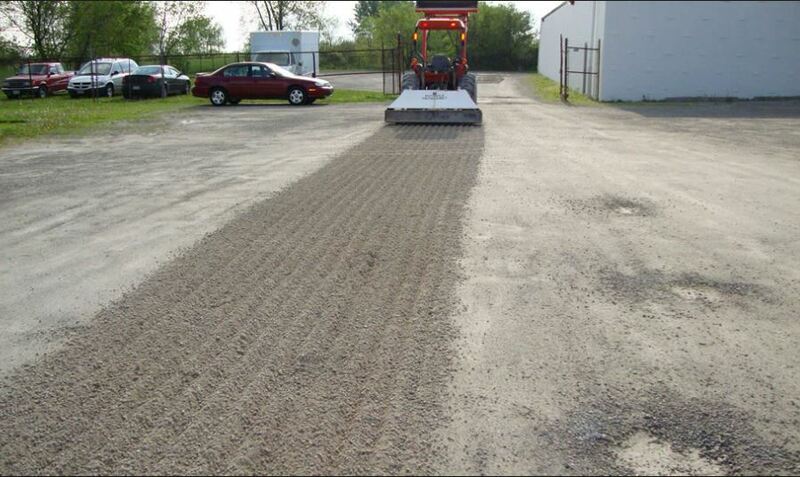 For clients seeking to repair a damaged Gravel parking lot in Trenton , click here! Gravel is low-maintenance material partly because it freezes and thaws without the destructive damage that occurs to asphalt pavement and after decades, when the gravel has washed away or has been pounded into the subgrade a new layer of gravel will set all to right making it fairly inexpensive to resurface a gravel driveway. Displacement of gravel causing ruts and pot holes and weed growth are common maintenance repairs that the property owner will have to face with some regularity. However, these faults are usually easy and inexpensive maintenance repairs. In a heavy snow area, when plows have to be used to clear a gravel driveway or parking lot some gravel can be lost to the plow which will then have to be replaced come spring. All topsoil should be removed and then the subbase should be sterilized to keep the subgrade weed free. The site should be professionally graded so that it slopes smoothly and gently to provide proper drainage away from the building and the driveway itself. Gravel spread on a surface with side forms or edges made of wood, brick or concrete block will prevent the gravel from spreading into areas beyond the driveway. Keeping the gravel off grassy areas that need to be mowed will make that maintenance task safer. Subgrade is the ground level of soil left after the site has been graded and topsoil excavated for the driveway it should be compacted- not loose or full of holes. A new layer of compacted soil can be added to provide a firm foundation if the underlaying soil is too sandy and prone to movement. Subbase is the layer of crushed stone that lies directly on top of the subgrade. This 4 to 8-inch layer is comprised of the larger diameter of aggregate and provides additional structural strength and support for the driveway. Surface gravel is the final 4 to 6-inch layer on the driveway. This is the finest grade of aggregate on the driveway and will fill in the remaining voids when compacted. Gravel shapes should be angular with sharp edges as these are able to lock in place with adjacent pieces when compacted, whereas, round pieces of gravel are unable to lock in with each other. Each layer of gavel should be compacted which will keep the gravel on the driveway instead of flowing off with storm water. Gravel Parking Lots are mostly installed for rural stores, camping sites, boat launches, nature centers and garden supply centers. These sites need to be inspected to evaluate the strength of the base and the overall grade to estimate what changes have to made to support positive storm drainage- no client wants to see their just finished gravel parking lot washed away in a downpour. Excavating the topsoil over the entire site is very important to the stability of the gravel parking lot to prevent it from sink holes and constantly shifting ground which is what happens if you just dump gravel over topsoil. Topsoil undergoes aeration constantly by plant growth, worms and other burrowing insects which makes its structure loose and crumbling- a very poor support base for vehicles driving and parking on it. The settling never stops for several years as the debris within the topsoil decays and the ground compacts further so it becomes a never-ending cycle of adding more gravel to repair it. After excavating the topsoil, a compacting roller should be run over the site to compress any loose soil that remains. 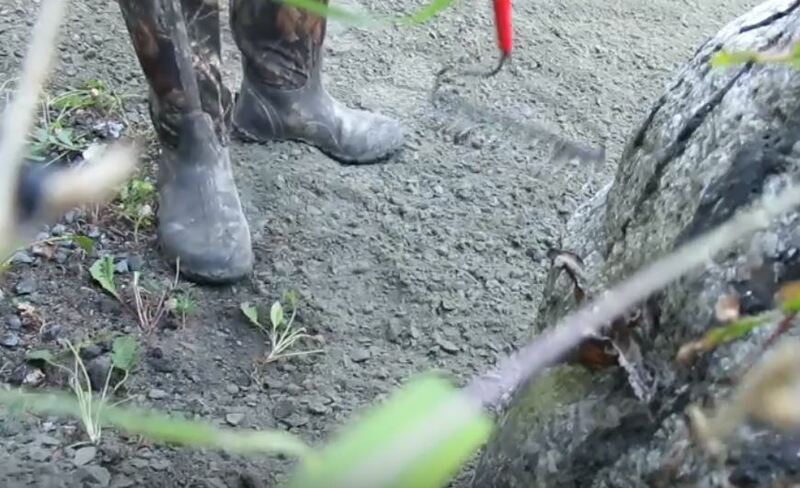 Next, the ground should then be sterilized to prevent weeds, fungus or other plant growth. Finally, the layers of different sizes of gravel can be compacted on top of the site: First a layer of the larger diameter gravel that is rough- meaning angular in shape with sharp edges that when compacted allows the gravel to grind together and lock in place. Secondly, a layer of smaller diameter rough gravel should be compacted on top of that. Finally, crushed small diameter gravel is compacted over the surface to create a smooth surface for the parking lot. Common reasons to replace a gravel parking lot are gravel displacement, weed filled, storm water ponding, deepening ruts, potholes and sometimes an addition is desired, such as a small Zen Garden at a garden center. Grading the site paying attention to a positive drainage and then re-building the gravel layers is the best way to replace a failing gravel parking lot. Jersey Strong Paving land excavators are experienced at land and water management no worries over our parking lots taking on water. Gravel parking lots and driveway repairs can be as simple as raking the gravel back into any low spots or a power raker can reset and level the entire parking lot or driveway. If too much gravel has been lost, more can be added to bring the parking lot and driveway back into a like new condition. Potholes need to be fixed so they don't ruin the alignment on users cars which means the hole needs to be widen a little before fixing so all the damage gravel can be removed and reset with additional gravel. Each gravel layer needs to be compacted for the gravel not to get kicked out of the pothole. Repairing ruts may require some digging out of the failed gravel subbase removing the weaken soft soil then compacting new layers of gravel to fill in the void. Ruts can also be caused by water infiltrating the base gravel or subbase. When water infiltration is a problem encouraging erosion and washouts, the shoulders need to be lower that the driveway so the water can be diverted into drainage ditches.